The airplane in the model isn't really moving, of course. It is sitting inside a huge sphere painted with a sky image. It's a very fun project - sign up and you'll get the write-up on August 15. This Should Get Mark into the GTA! This animation stems from a lesson I do in 6th Grade where the students create a model of the Solar System as it was at the moment of their birth. They research planetary orbit radii to model the orbits, generate an image of planetary positions as of their “birth moment,” and then position planets that I scaled at those positions. The scale of the planets is not the same as the orbits because the model is not as fun if they were! Each planet has a “detail” layer. The students import related 3D warehouse models and/or Planetary Factoid Images, that they create, onto those layers. They then disappear and appear the models/images as their animation tour progresses through their Birth Moment Solar System. For my animation I added different styles to change the background and edge colors to enhance some of the models. I also added another 6th grade project at the end where the students create a prism that has a 3D model of a constellation of their choice, usually their birth sign. This animation uses my example model of Orion – I attached the Google Icons to each of Orion’s major stars and used the CMP layers to change visibility during the animation. This model uses a whole bunch of scenes (the tabs across the top of the screen shown below), for changing visibility of styles and layers This is how Mark "disappears" and "appears" various parts of the model as the animation focuses on a planet. This to me is the perfect integration of Google apps and features - hard to see how Mark doesn't get accepted with this. Good luck!! What's Coming in Our July Projects? 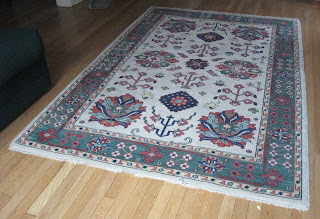 The idea for this project comes from my upcoming Interior Design textbook. 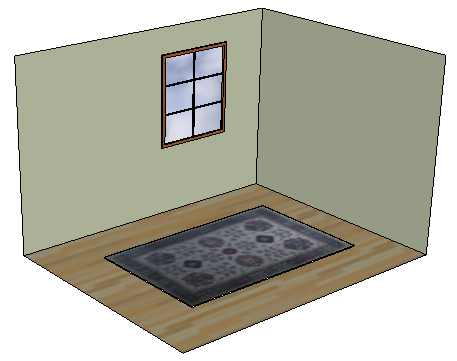 It shows how to take a photo of a rug (or a picture, wall hanging, door), and use it to create a "real" rug in your SketchUp model. 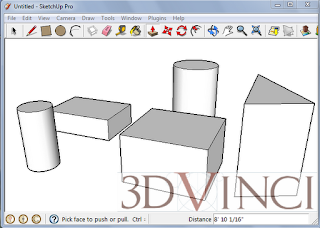 Wouldn't it be cool to attach your own logo or graphic to your SketchUp models? This project shows you how (check out the 3DVinci logo below). Don't let our summer sale pass you by! So much fun for just $20 - get our Projects of the Month today! Last Friday, I went up to Brooklyn, NY to pay a visit to Makerbot Headquarters. One of their engineers showed me around, and now I want a Replicator even more than before! Their big, warehouse-type room housed a design team whose job is to test out the printers by coming up with interesting 3D models. I'd call that my dream job (except that it was 100 degrees outside and their office isn't air conditioned!) There were also maybe 15 Replicators scattered around, with maybe 10 churning out various things. Here's a short video I took of the Replicator building up a pumpkin - they wanted something orange to test out a new orange plastic color. The model looked to be about 4 or 5 inches high when completed, and the total production time was maybe 3 hours. They have a lot of display cases about, showing off some of the fun things they've printed. My thoughts on the Replicator involve taking it to schools, libraries, labs, etc, and getting kids to design and print whatever comes to mind. Apparently the majority of these models start either in Tinkercad (for the younger crowd) or SketchUp (for more sophisticated designs). For organic shapes, like that pumpkin above, the designers used Zbrush. The main drawback, at least at this time, is that a small model (think around 3" x 3" x 3" or similar) can take an hour or more to print. So the machine would need to be kept somewhere for a few days at least, assuming each kid in a class wants to print his or her own thing. If you have one of these machines, I'd love to hear feedback! Email: bonnie - at - 3dvinci.net.